Crisis is brewing in the All Progressives Congress (APC) in Ondo State, over the regrouping of a faction of the party which worked for the Alliance for Democracy (AD) in the last year gubernatorial election in the state. The faction, led by the embattled chairman of the party in the state, Isaac Kekemeke has regrouped and named itself “the authentic APC”. 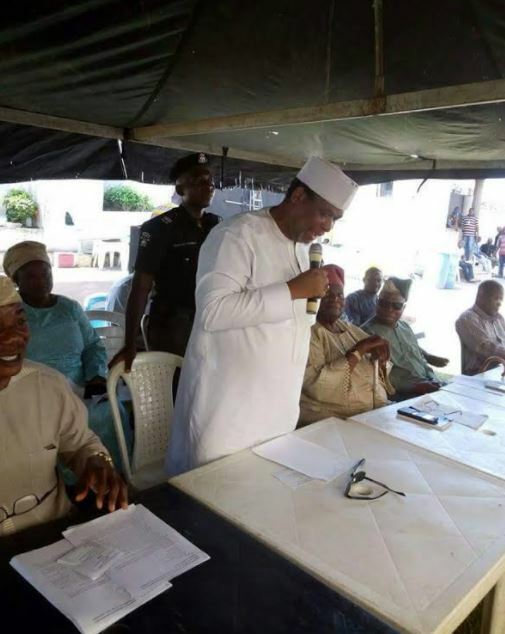 The group including Senator representing Ondo North Senatorial district, Prof. Ajayi Borrofice, member representing Idanre /Ifedore federal constituency, Baderinwa Bamidele, state Vice Chairman of the party, Gboyega Adedipe, Babalola Taiwo and Ife Iji, held a meeting in Akure, the state capital late Monday night. Kekemeke, Borrofice and others who spoke at the meeting boasted that they are set to take the party back. At the meeting, Kekemeke insisted that he remained the chairman of the party in the state. But, it was gathered that the meeting came after the fallout of Tinubu’s visit to Akure few weeks ago. A competent source who does not want his name in print told DAILY POST that the APC national leader in a brief meeting with Akeredolu, begged him to be magnanimous in victory and allow those who worked for the AD to come back to the party. It was gathered that Tinubu who met brick wall with Akeredolu had directed the AD group to use all available means and get back into the party. There was allegation during the last election that Tinubu sponsored Olusola Oke of the Alliance for Democracy against Akeredolu. Oke’s Choice was after Tinubu’s annointed candidate, Segun Abraham lost the primary election. The outcome of the September 3rd, 2016 Primary election is still in court. Already, the Deputy chairman of the party in the state, Engr. Ade Adetimehin is the acting chairman of the party. A source close to Kekemeke said they are only ready to fight dirty to get back into the party before the next congress.The party is expected to conduct a fresh Congress early next year. All efforts to contact Kekemeke proved abortive as he was not responding to calls. Also, media aide to senator Borrofice, Kayode Fakuyi declined comment on the issue.